Stacking holder for FSTK fiber splice tray with built-in fiber spooling. 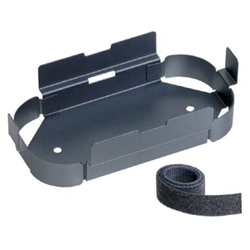 Holds and secures one/two splice tray(s) with Panduit® Tak-Ty® Cable Ties. Mount with existing enclosure hardware. For use in FWME2 wall mount enclosure. Fiber optic splice module holds and protects up to 24 fusion splices. Self-stacking modules with integral cable management and fiber slacking/spooling features. Black plastic base and clear plastic hinged cover. For use with Panduit Opticom® FCE*U, FRME*U, and FMT series enclosures.